By White Lung's standards, "In Your Home" is a relatively mellow track, and now they've given this album-closing cut from Deep Fantasy its own music video. Beginning with echoing guitar atmospherics, the song moves along at a marginally slower pace than the band's usual breakneck punk. 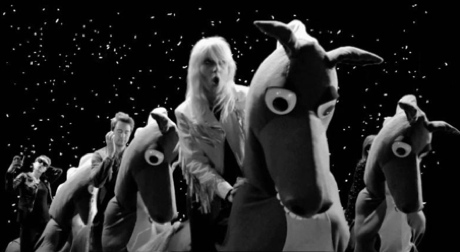 In the accompanying black and white clip, which was directed and produced by Justin Gradin and Ben Jacques, we see some impostors perform the song while the band ride fake horses in slow motion and quirky animations appear in many of the shots. Frontwoman Mish Way said in a statement, "This video was created by Justin Gradin and Ben Jacques. Justin has done all our album art since our first LP so 'In Your Home' is funny, demented and uncomfortable, it's perfect. The star of the video is my dear friend Christina Kenton who pushes the baby cart and smiles at the end. She's an incredible artist herself. This video is filled with people way more talented than the four of us." In case you missed it, White Lung are currently on Exclaim! 's cover.